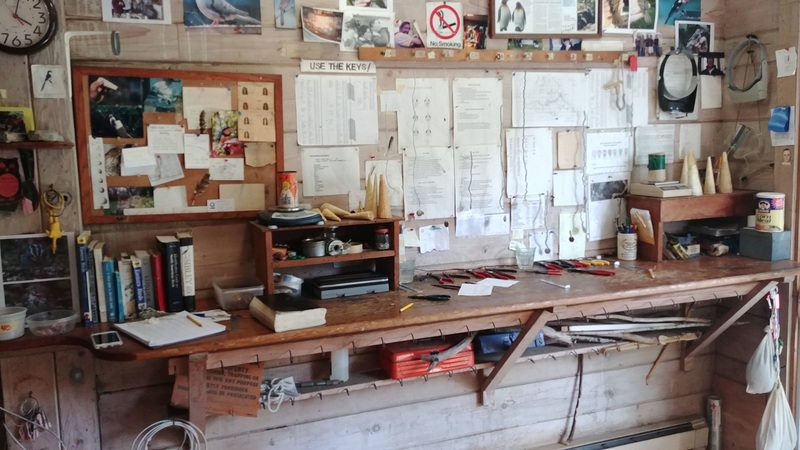 Cold mornings and sunny afternoons combined with northwest winds have made for an active week in the banding lab. We ended the week with 215 birds banded and 86 recaptures processed. With just three weeks left in the banding season, our totals stand at 1,298 new birds banded and 710 recaptures processed. A gradual trickle of Myrtle Warblers has been replacing the Blackpoll Warblers, with only 13 new Blackpolls caught this week compared with 42 Myrtles. Blackpoll Warblers still hold their place as our most frequently banded this season with 301 individuals. Hermit Thrushes and White-throated Sparrows have been our next most commonly caught species this week. A Slate-colored Junco, first banded in 2017 as an after-hatch-year male, was recaptured as well. 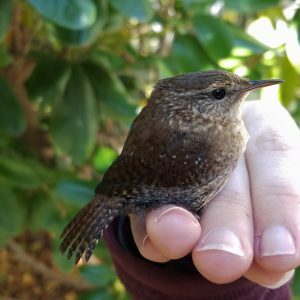 Our new captures for the week include Winter Wren, Slate-colored Junco, Fox Sparrow and White-eyed Vireo. The Fox Sparrow is one of the largest sparrows in the Northeast. This species is not often caught since individuals usually arrive after the nets come down in November and leave before Spring banding begins. 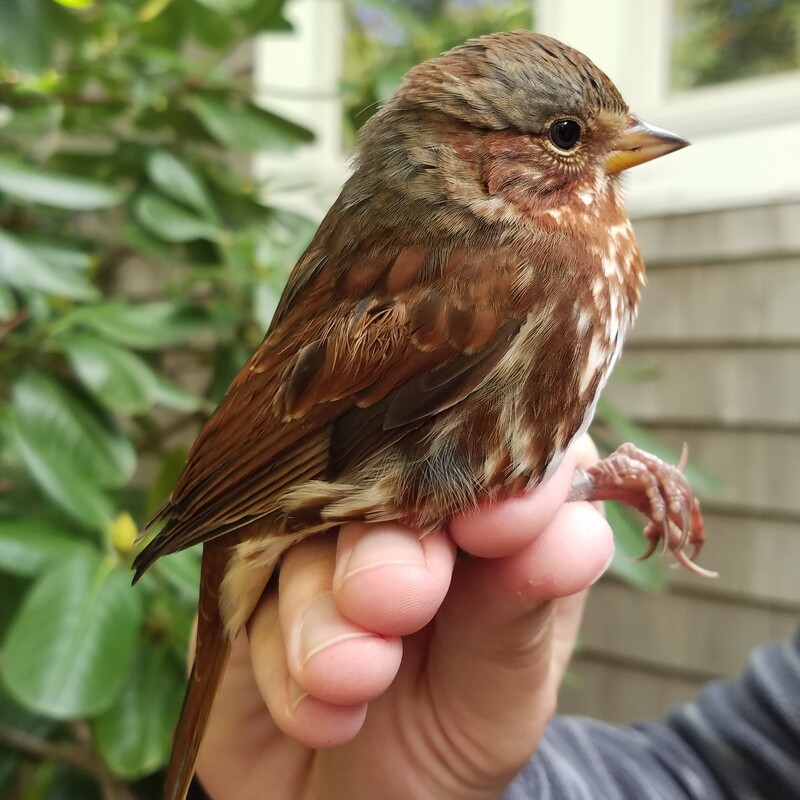 After being banded, the Fox Sparrow has continued to spend time in our Garden for Wildlife, rustling in the leaf litter with the White-throats – look for a larger sparrow sporting a gray cheek, rusty coloration, and yellow bill. The Holmes Farm is currently playing host to a tremendous variety of birds. A mixed-species flock of 75+ sparrows have gathered in the patch of vegetation in front of the farmhouse, feasting on seeds of the senescing summer grasses and herbaceous plants. Orange-crowned Warblers and Ruby-crowned Kinglets can be seen sifting through the expiring goldenrod, as they unobtrusively glean insects. Meanwhile, Eastern Phoebes sit on the perches that Manomet staff have provided, gobbling down field cricket after field cricket. Wednesday started with a ruckus on Cranberry Hill, as a Barred Owl’s presence drove several American Robins into the nets. Wind and rain in the afternoon allowed an expedition to relocate the owl in the woods adjacent to the open fields. Sitting silently in the crown of a maple tree as the wind howled, the owl’s dark eyes watched Alan, Nick and Megan as they scoured the trees. Finally spotting the owl at the top of the tree, the owl took one look at the interlopers and flew deeper into the woods. The last record of a Barred Owl on Manomet property was from 2013. Usually treated as uncommon, orchids can grow in a variety of conditions including bogs, old growth forest and cultivated gardens. Take a look to the right as you enter the main building and you’ll see a small spike with irregularly shaped white flowers growing up the stalk. Blooming in late summer and early fall, this orchid is a Lady’s-tresses (Spiranthes cf. cernua) a perennial that will grow in meadows, thickets and open woodlands.